Very Important Families (VIFs) arrive at Operation SEAs the Day’s The Heroes’ Welcome Home parade at the Freeman Stage at Bayside during last year’s event. • Thursday, Sept. 6, 6-9 p.m. — Family Night — The families will be in downtown Bethany Beach, having dinner, shopping and enjoying the beauty of the town. People can recognize the families by the OSTD ID tag they wear (a red-, white-and-blue VIF tag). Those seeing any of the VIFs can take the opportunity to thank them for their service and sacrifice. • Friday, Sept. 7, 4:45-5:15 p.m. — The Heroes’ Welcome Home — The community will honor the VIFs by lining the streets to cheer and recognize the families as a motorcade leaves the Marketplace at Sea Colony along Route 1 through South Bethany and onto Route 54 toward Selbyville and into Bayside and the Freeman Stage. 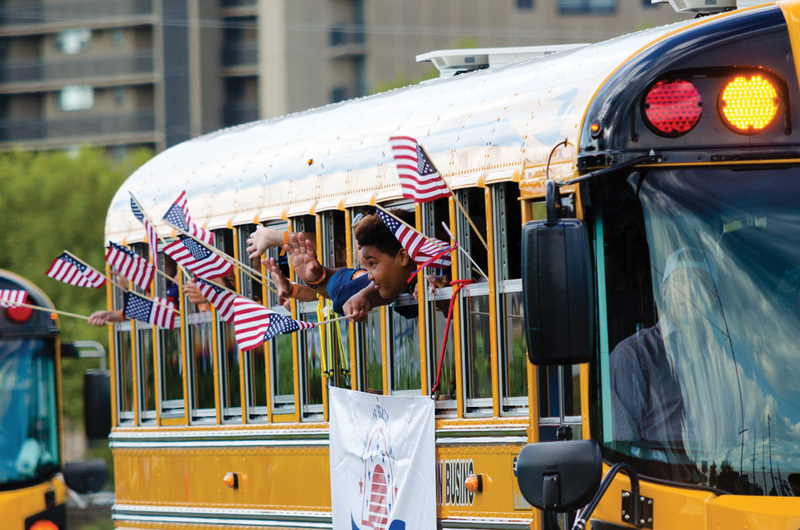 Buses carrying the families will leave Sea Colony at 4:45 p.m. and arrive at Bayside around 5 to 5:15 p.m. Those lining up are being asked to wear red, white and blue and wave an American flag. • People can also wear an Operation SEAs the Day 2018 T-shirt and/or hat, which can be purchased at the Sea Colony Beach Shoppe, located at Sea Colony Marketplace, Route 1, near Bethany Beach, or at Sea Crest, 99 Garfield Parkway, Bethany Beach. • People can also support the more than 100 local businesses that have contributed to the effort to provide a great week for the honored heroes and their families. Contributing businesses may have 4th Annual — Proud Supporter of Operation SEAs the Day signs in their windows. • Saturday, Sept. 8, 11 a.m. to 1 p.m. — The Cripple Creek Classic Car Show offers free entry to all spectators. The Award Ceremony includes Veteran’s Best Pick in show. The show takes place at Cripple Creek Golf & Country Club, 29494 Cripple Creek Drive, in Dagsboro. To learn more, go to www.cripplecreekcarshow.com. For more information on Operation SEAs the Day, go to www.operationseastheday.org.